This page corner bookmarks post is sponsored by The Brand Connection/Pentel, all ideas and opinions are my own. Someone who works at Pentel is my soul sister. Or soul brother. Someone over there was writing (with a very nice but I imagine also sort of plain pen) one day and thought about how awesome growing up in the late 80s and early 90s was and the sheer awesomeness of the stuff we had to write and decorate things with. Aside from the many hundreds of puffy stickers and scratch and sniff stickers, we had all kinds of cool ways to communicate, and write stuff down…write notes to pass in class (I’m really sorry, Mrs. LaRoche, for every note I passed in your 10th grade English class), do M.A.S.H. and even make fortune tellers. Someone at Pentel experienced these things and remembered how awesome all the milky pens and stuff were back then and thought to themselves, “Let’s bring milky back” and so they did, and then they asked me if I’d spend some time playing with the kids and crafting something delightful. Well, I can’t very well encourage my children to pass notes in class, because, well, that’s impolite and awesome pens may also be confiscated. I also know that my kids can all make fortune tellers on their own, so “meh” to that. But we’re at back to school week (finally) and there’s going to be page marking and homework assignment writing and books to be reading and we realized we could make some SUPER SIMPLE bookmarks and then decorate them with the awesome pens that bring me right back to my youth and eventually after the girls called me back to the present day, we sat down and made a slew of bookmarks. (Seriously, I think that we used a whole package of origami paper in under an hour). Don’t stop at our bookmarks. Once you get those pens, you’ll be wanting to carry them in the back pocket of your acid washed Jordache jeans and just waiting, patiently, for someone to need a pen and then you can be all “HEY YOU GUYS LOOK AT MY PEN” and you’ll have people fawning over your cool new pens. 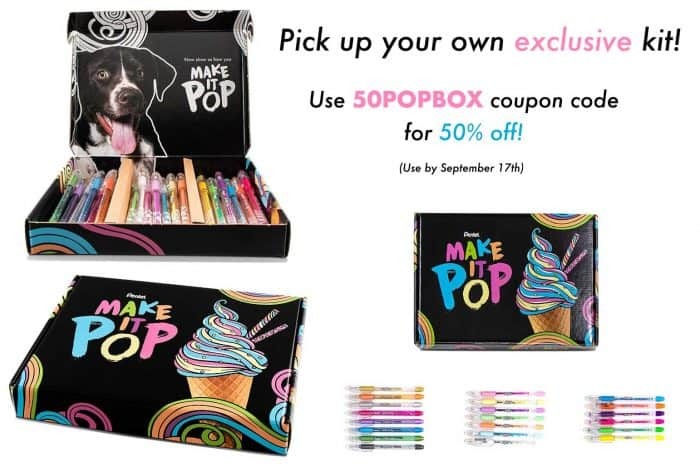 There are lots of my colleagues working this same campaign and you can find all of their projects and other fun ideas to be creative with cool pens by clicking right here to visit the Pentel Pop page GO RIGHT NOW we will wait. 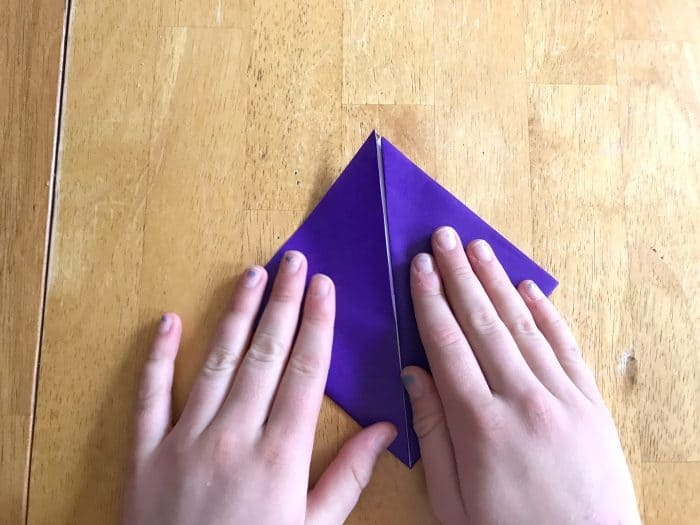 Thin square paper- origami paper works best. Thicker papers will work but will be a bit harder to get a good crease on, especially for younger children. It does need to be square, so if you only have rectangle, go ahead and trim it now. We’ll wait. 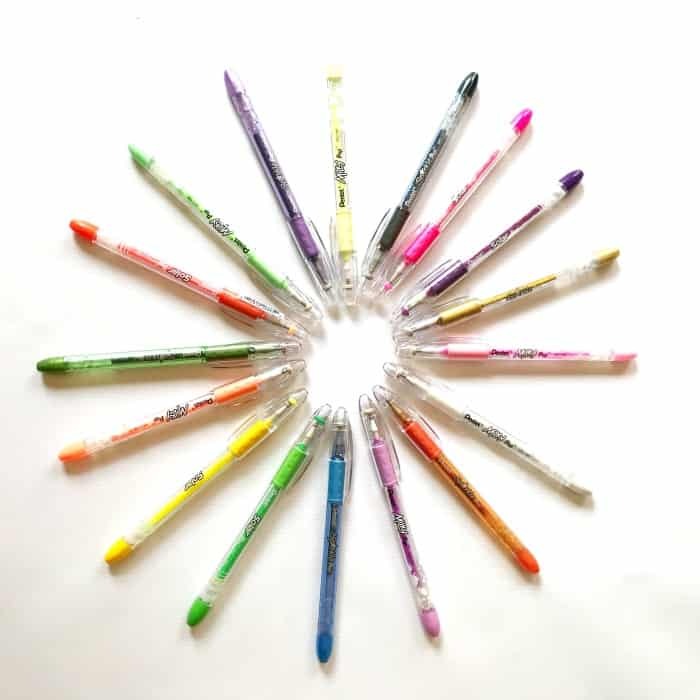 Pentel POP Pens– We used a combination of the Milky Pop Pens, the Sparkle Pop Pens and the Solar Pop Pens. That’s it. That’s all of your materials. We’re on a simplicity kick this week, friends. If you grew up in the 80’s or 90’s, your inner child is squealing with delight at these epic pens from Pentel. 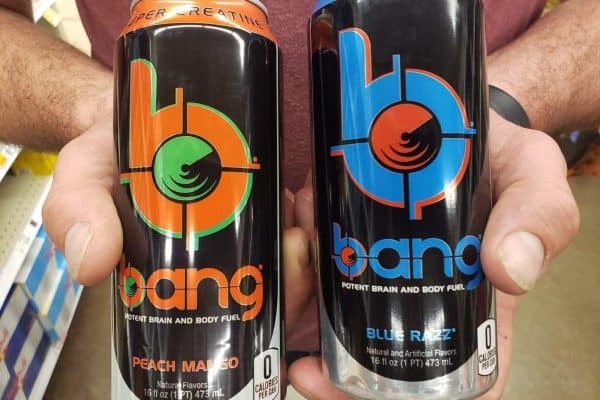 It’s like all the cool stuff is coming back from our childhoods, although I’m hoping that a few things we loved back in the day get passed over. Puffy stickers are good. Puffy bangs sitting six inches above our heads are not so good. 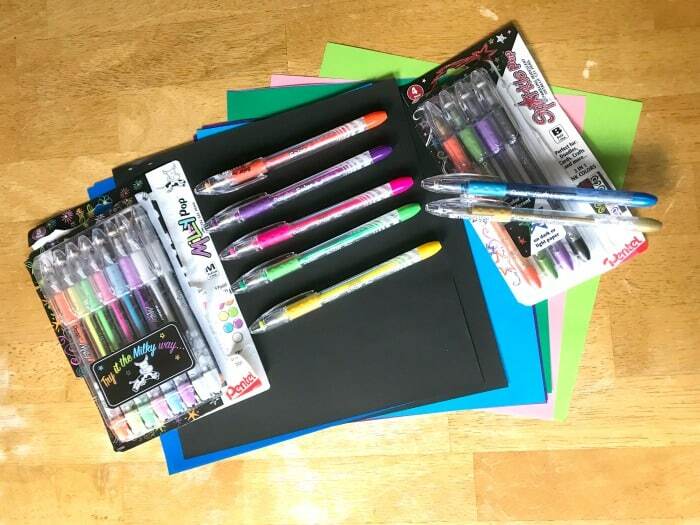 Neon color pens and cool ways to draw, write and design things? EPIC. So, here is a video of the miniest Martin explaining how to do page corner bookmarks. After that, you can see a step by step photo process. Easy, peasy. 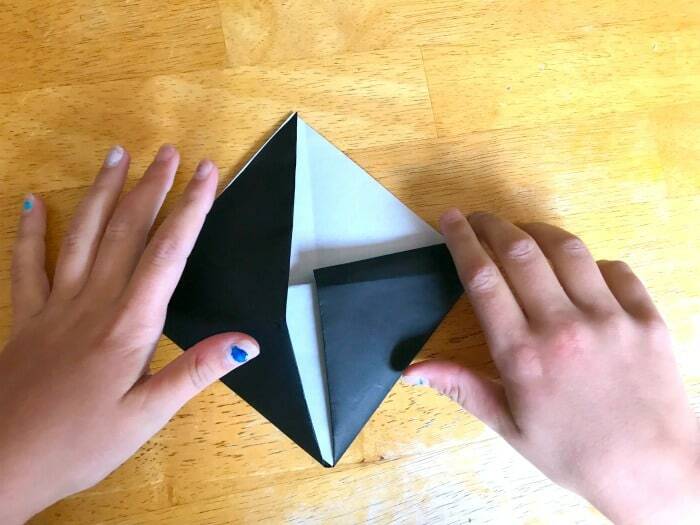 Take a sheet of your origami paper. If you really want your POP pens to have a wow impact, use black paper. Trust me. It’ll make your late 80s-early 90s heart go pitter pat. You’ll totally be “like wow!” all day long. 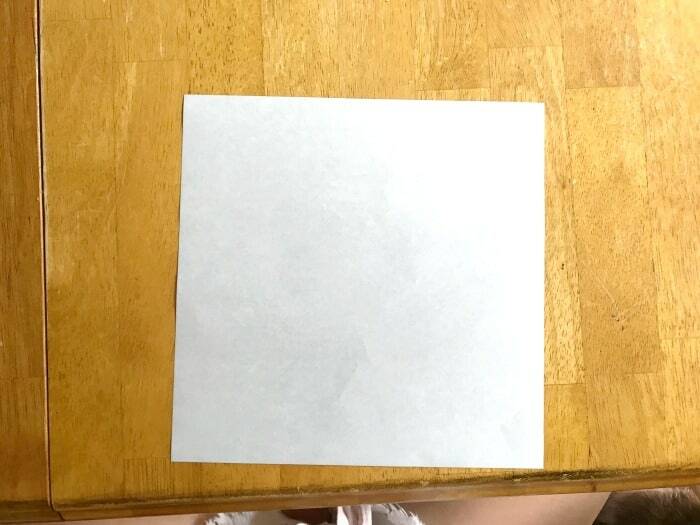 Take your square paper, and if only one side has your color, place it white side up on the table in front of you. 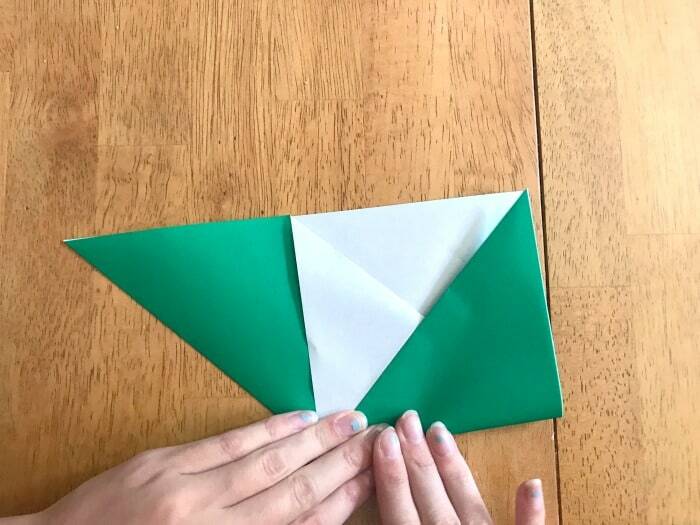 Fold the bottom point right up to the top point, and make a nice crease. Open paper back up, and fold the other corner tip up to the top corner tip. Your paper will have a crease in the middle now. 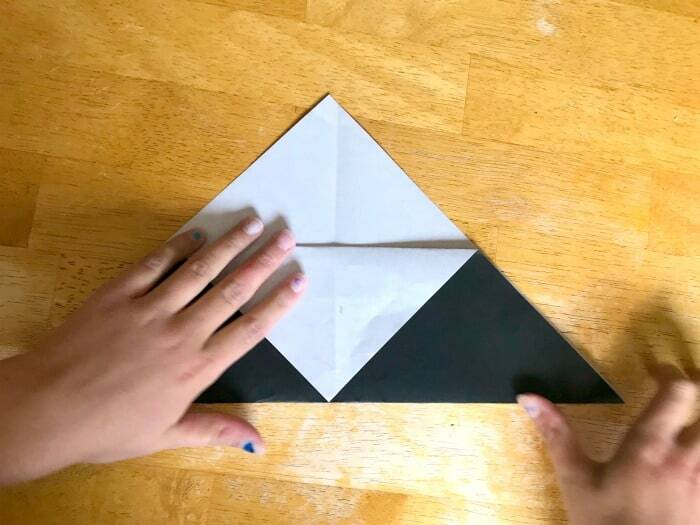 Fold the top corner point down to the middle crease. 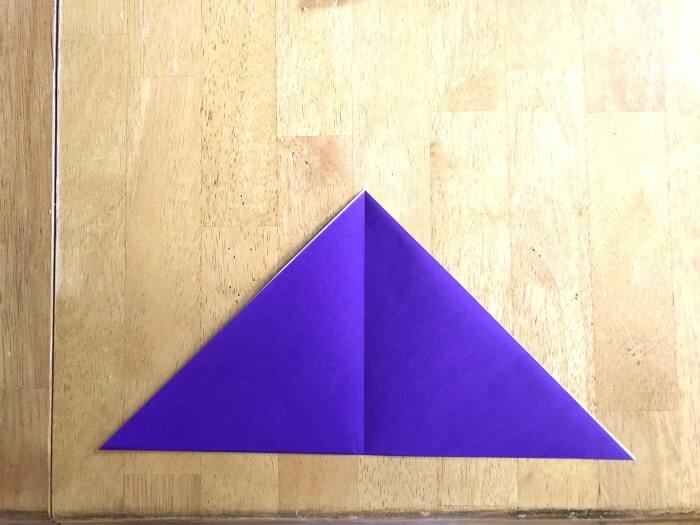 Take the bottom right corner and fold that tip up to the top corner point. Repeat with bottom left corner. It’ll kind of look like a diamond shape when you’re done. Make sure to make those creases nice and sharp if you haven’t yet. Next is the only “tricky” part and it’s really not. 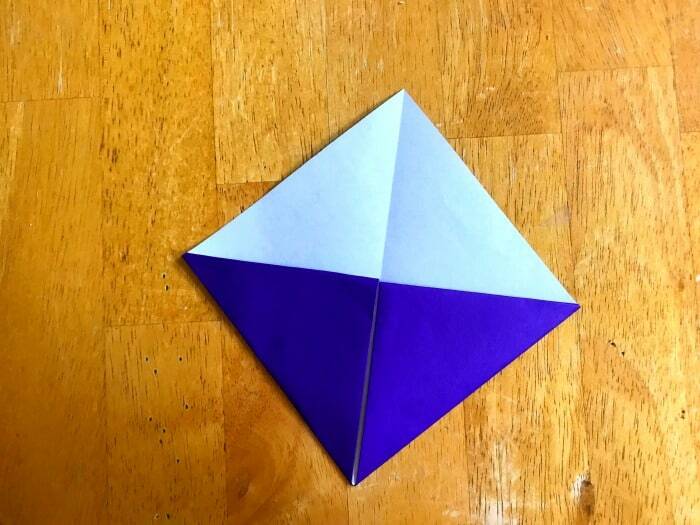 Take the tip of one of the points you just folded up to the top and tuck it behind that folded down flap. You’re pretty much done now, just flip it around so the tucked parts are at the top. Now comes the really fun part. Personalizing and making the bookmarks YOURS! Grab those Pentel POP pens and go to town! My youngest cracks me up. Writing my URL was 100% unprompted. I guess that’s what happens when you grow up with a mom who blogs! I LOVE how the Milky POP pens show against the black paper. So fun- and not the same art supplies you see every day, so they definitely stand out in a crowd. The Milky Pop pens also write on photo paper. Kind of a cool fact, right? LOOK at the sparkle coming right through! 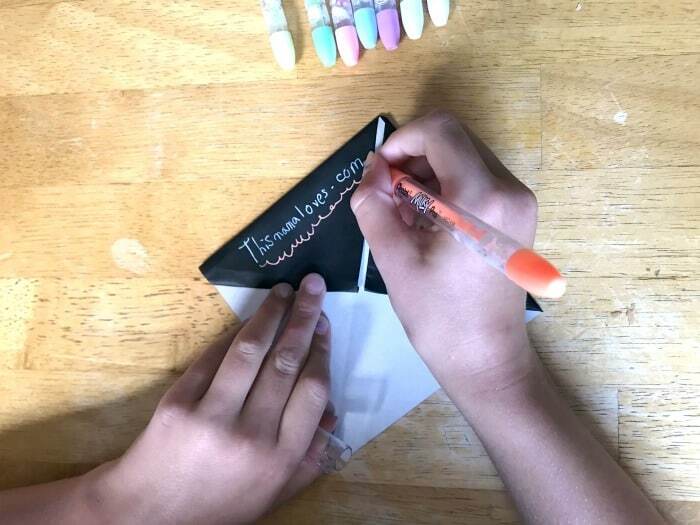 The kids were loving these pens, and ended up making several for each of them to use for textbooks at school, not just for books they are reading at home! The color changes if you are writing on black vs. white paper (scroll for example)! You can draw, do lettering, doodle, or put an inspirational quote on your bookmark. We had fun looking for some to put on ours. So why so much love for these pens? Well, LOOK at them. Milky colors? YES!! It’s like I’m rewriting my childhood (except my penmanship was better in the 80s and 90s, but still) in vivid colors. Sparkles? The world needs more sparkles. I’ve tried tons of pens that promise to write with sparkly or glittery ink. They either deliver but also make a mess of my hand (the curse of the lefty) or they don’t sparkle at all out of the ink barrel. Either way, I’ve always been disappointed. The Sparkle Pop pens really do SPARKLE! It’s like a magical unicorn ink or something. I just hope they keep making it in a pink because pink sparkly things make me happy. Ahem. 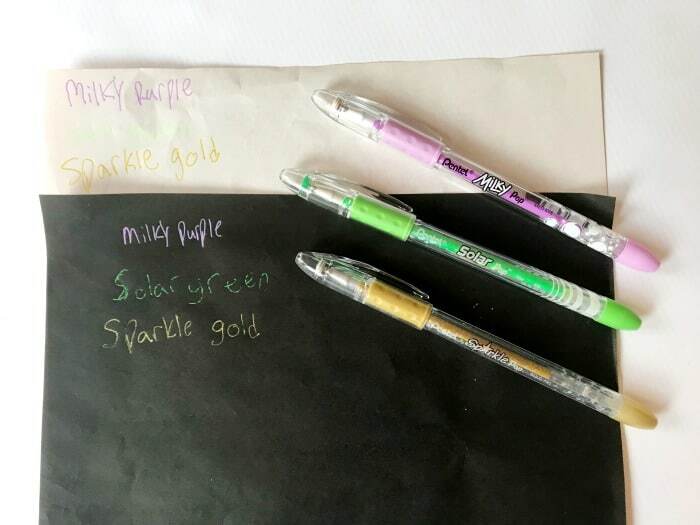 Sparkle Pop pens also change color depending what color paper you happen to be writing on. That’s right. Do your pens do that? Mind do not. And this is a cool feature, so don’t expect to see my kids holding these colors of delight. Mama’s going to hoard them. (Anyone can hoard them, and grasp them- all of the Pop pens have a nice latex-free grip for comfortable writing and drawing). The kids are off and running with ideas of a graphic novel/comic book series and have taken my POP pens. They don’t know that there’s a 50% off code for Pentel Pop pens and mom ordered one that won’t be shared. HA! Wow! This is indeed a great idea. My little cousin loves to do crafts and for sure she would love this. I’ll share this to her so we can both watch the video and learn at the same time. It is a fun little craft. 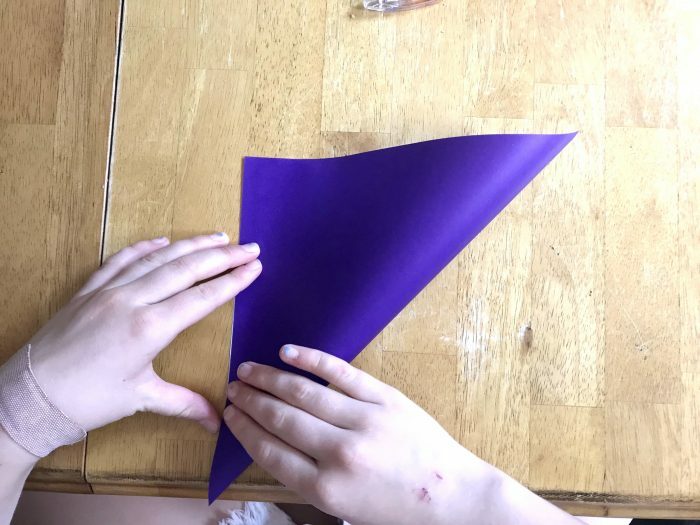 Even if kids can’t help with the folding they can help decorate! Nope! It doesn’t! 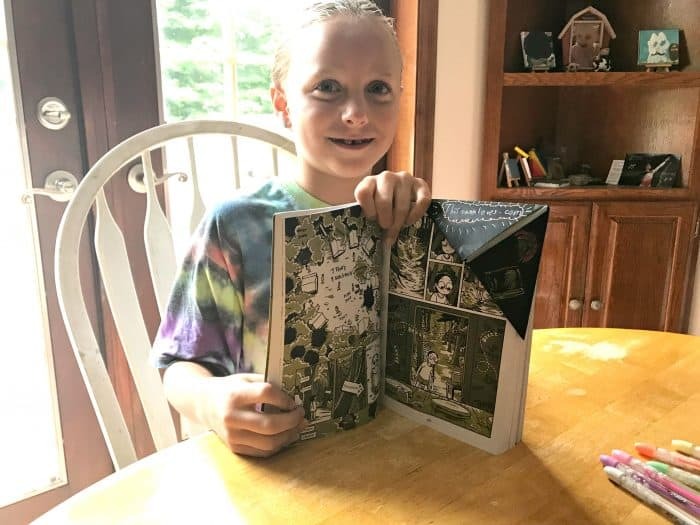 My friend Karly came over this weekend and had so much fun writing and drawing with us that I ordered her a set on Amazon for a surprise. She got them yesterday. 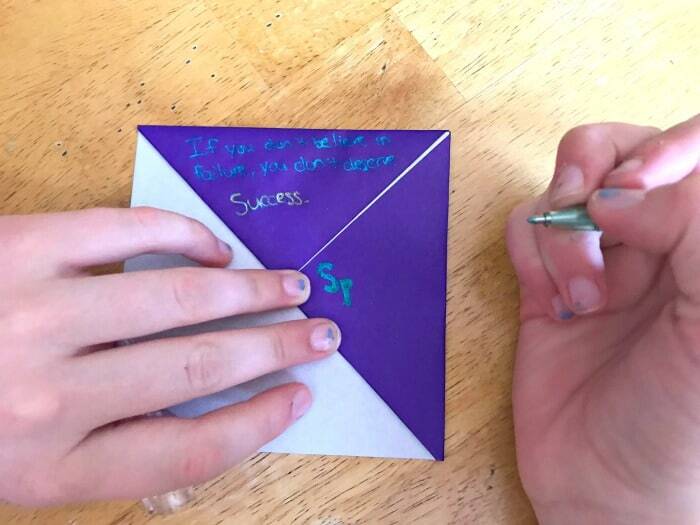 Spread the pen love! I love this fun and creative idea! It’s so cute to make a bookmark and design with whatever you want. I’ll definitely try this. My kids love these kinds of pens especially my daughter whose note-taking is important. She always want her notes to be neat and pretty as their teacher grades it. Such a fun activity for the kids! I think it’s awesome to make these for school plus they can pick the colors and design it however they please! Definitely something that they’ll love! This is something I can totally make with my nieces and they would love it! Heck, I need it for all of my books – I always start one before finishing another. My kids would love these pens! 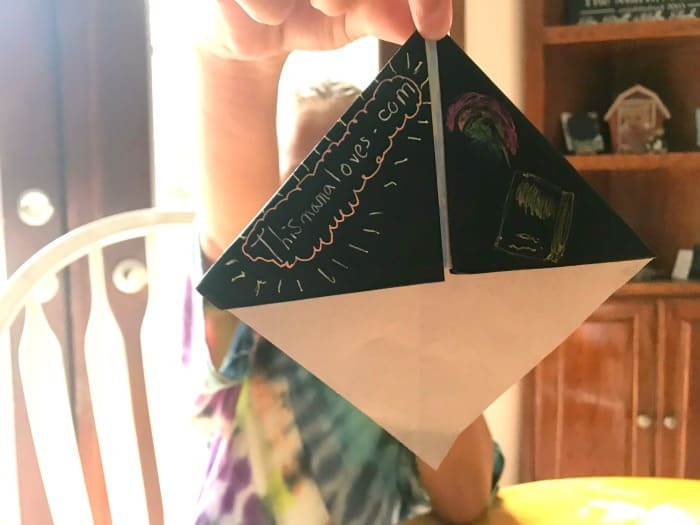 I want to have them make these page corner bookmarks, it would be a great rainy day craft activity. Thanks for the idea! I love your bookmarks. It’s such a creative way to save your spot in a book. 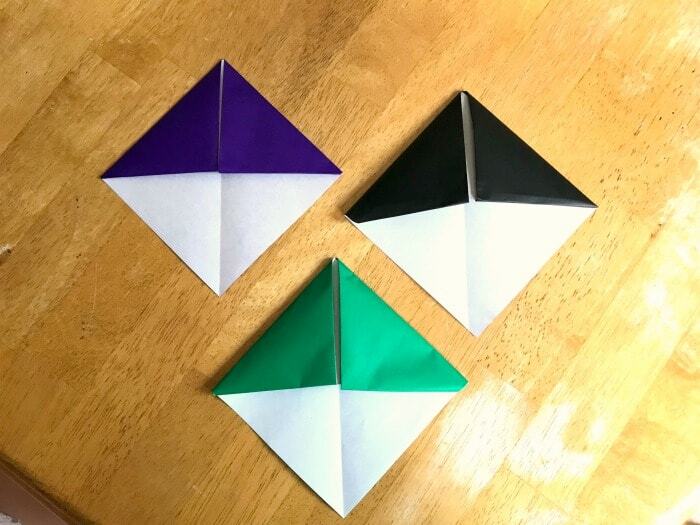 Now that my daughter reads chapter books, I need to make a few of these! I love how cute and simple this is. 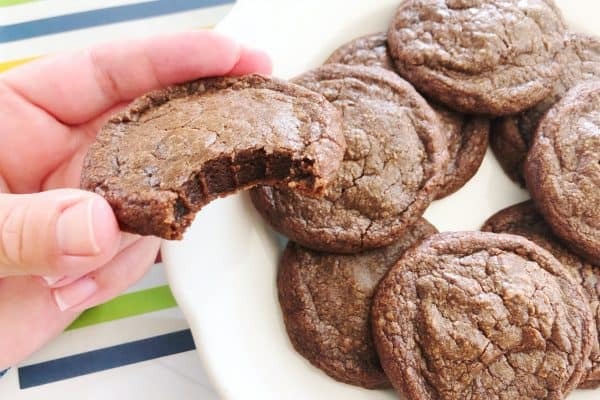 My daughter would love to make some with me. I remember making something similar when I was in school. Although, I also remember my fair share of folded notes, too! Haha! ME TOO!! and doing MASH. did you? This is such a clever idea. This would be perfect to do with the kiddos for back to school. I love these. 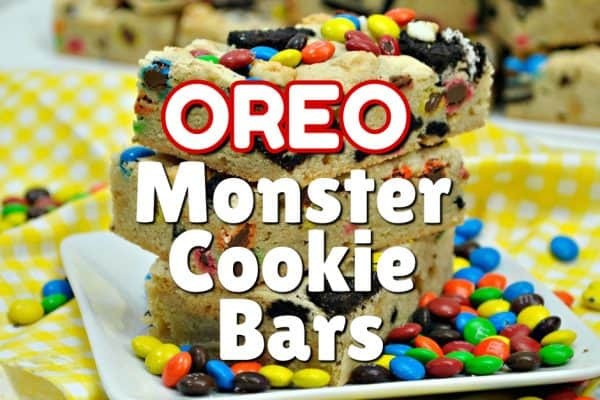 I so need to make some. Reading is one of my favorite things to do, so I go through lots of bookmarks. I need a bunch of these for my son. He likes to fold the pages of books to mark his sopt. That is a habit I’m trying to break. 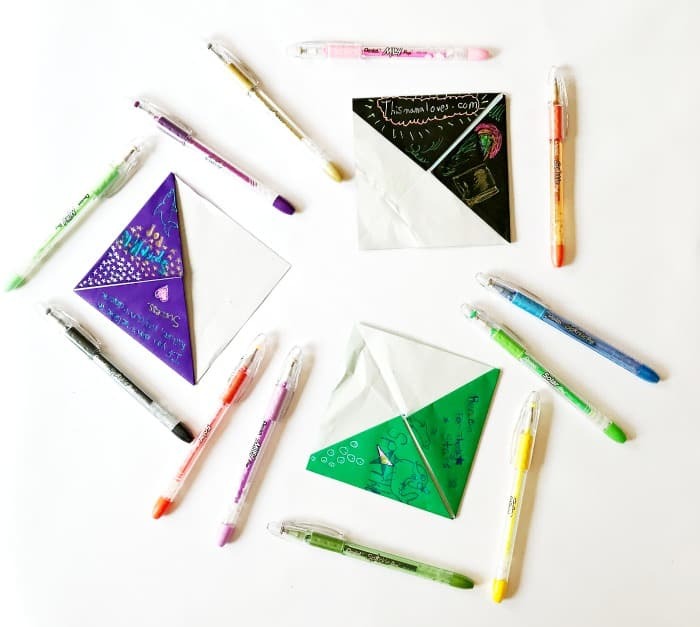 These totally take me back to middle and high school…thats how we folded notes! We had some pretty complex note folding methods in jr high and high school back in the day! Thank you for demonstrating this because they were larger than what I expected! Super cute. I found some paper at a craft store that is printed on two sides that I think would be awesome for this project. oh i bet that will be cute!! i made some for the kids with love notes from mom and hid them in their new textbooks for school. So simple and easy, aren’t they? And useful!